These radar images of Titan were taken by Cassini as it flew by the Saturn moon on Feb. 15. 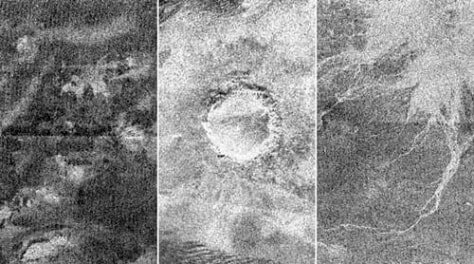 The image at left shows a complex of bright hills and ridges surrounded by a dark plain; the one in the center shows an impact crater about 60 kilometers (37 miles) in diameter. The image at right shows channels similar to what was found at the Huygens landing site.